What is the difference between Single and Double Gloucester? What are the crunchy crystals found in hard cheese? Grass fed cheese, meat and dairy – What is it and who does it? Here are Kathy’s and Andy’s favourite cheese gifts and gift selections for this coming Father’s Day. The Courtyard Dairy’s New Venture…. Unpasteurised v. Pasteurised cheese – what are the differences? What is the difference between cheeses made with raw and pasteurised milk? Does it make a difference to flavour? Are there any health concerns? Below lists all the organic cheese producers in the UK, from farmhouse to large scale; those cheeses that are made with UNPATEURISED (RAW) organic milk are further highlighted. At last! The cheese-with-no-name is named! What makes a cheese a Cheddar cheese? The world’s most popular cheese, Cheddar still accounts for over half of all British cheese sales (52%), but what exactly is Cheddar? Aged for over a year? Another May passes and The British Cheese Awards have yet again graced their medals and awards to the best cheese makers (and mongers) in the country. Ever wondered what makes a Caerphilly, Cheshire and Cheddar different? Exploring territorial British Cheese – from Cheddar to Cheshire: what’s the difference? Over the last few months local North Yorkshire business The Courtyard Dairy and Blue Pig Company have teamed up to develop a brand new cheese: one made from pigs milk! What is an artisan cheese? And what do the words traditional and farmhouse mean? Yes, it’s that time of year again… and don’t forget that mums love cheese! For this year’s St Valentine’s Day you could keep up this tradition and give the cheese-lover in your life a delightful heart-shaped cheese (or maybe a whole cheese gift box!)…. Monthly cheese delivery – how do we decide which cheeses to send? Unveiling The Courtyard Dairy’s brand new Camembert Bakers. This week has seen the delivery of a new, long-awaited product: Camembert Bakers. Recreate that classic Alpine experience thanks to this intuitively designed raclette grill from Swiss manufacturer Stöckli. What is the difference between ‘crumbly’, ‘creamy’ and ‘tasty’ Lancashire cheese? Read about the different Lancashire cheeses: crumbly, creamy and tasty. Find out more about how they came about and what makes them taste so different! Buying cheese online in the UK can be a daunting task – just how can you be sure who you are buying from and the quality of their cheese? A justifiably famous French and Swiss Cheese, Vacherin Mont d’ Or. But how did it come about? And why is it still seasonal…. Yorkshire cheeses: what are the very best Yorkshire cheeses? Being a Yorkshire cheesemonger and with Yorkshire Day fast approaching (1st August) I thought now is an especially appropriate time to champion Yorkshire cheese! The ideal cheese gift selection? Richard III Wensleydale cheese – what makes it different? Why does The Courtyard Dairy stock Richard 3rd Wensleydale, instead of the very good Wensleydale cheese made at Hawes Creamery? Find out by clicking below…. The FDA in American is banning some cheeses due to cheese mites. 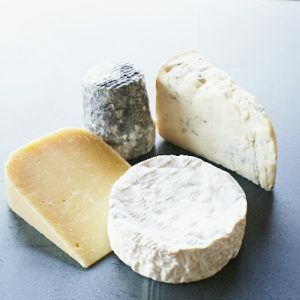 An explanation into the various methods of classifying cheese types by their texture and flavour. An explanation of the methods of classifying cheese by how it is made. Every year, brilliant, new, unusual and exciting cheeses are developed in the UK. Last year, for example, saw the introduction of Little Anne, Baron Bigod and Cais Na Tire. With Mother’s Day fast approaching now is the time to choose that cheese gift for your Mum! Where to buy the best cheese? 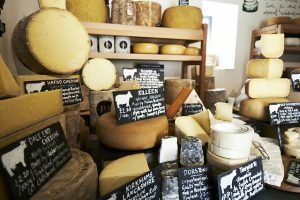 Britain’s best cheese shops…. What is the blue veining in traditional Cheddar? And can I eat it? I’m often asked if the natural blue vein that finds its way into non-blue cheese is edible. The answer is: by and large, yes. Scotland had lost all its farmhouse cheeses. They’d all gone to the great farmhouse cheese heaven. If you’d like to add height to your cheese wedding cake why not add separators between each layer. See more about how these separators work by clicking below. It’s not all about cheese! Sometimes Kathy and I have to eat other things too. The history of Stilton cheese: from it’s origins to present day…. Botton Village (and creamery) on the North Yorkshire Moors finally gets some recognition it deserves for the mighty fine Yorkshire cheeses it makes. Mites, mites, glorious cheese mites! Rennet in cheese – the science: how does rennet work? Rennet is one of the most important tools in making any cheese. But how does it work and what does it do? Cheese Wedding Cakes – how do you choose the right one for you? Contrary to popular belief, heart-shaped cheeses are not a recent invention for the Valentine’s Day bandwagon, but originated over 500 years ago. To read the story of heart-shaped cheeses, click below…. Part four – the first few weeks..
Part four of the four-part series on how The Courtyard Dairy was created. Click below to read more…. Part three – chilling it down. Part three of the four-part series on how The Courtyard Dairy was created. Click below to read more…. Part two – getting it open. Part two of the four-part series on how The Courtyard Dairy was created. Click below to read more…. Click below for details of the previous cheese tastings at The Courtyard Dairy. Rennet: what is the difference between vegetarian and animal rennet?